Laurie grew up vacationing in her family’s rustic, lakeshore camp. 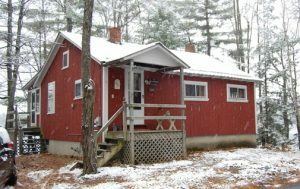 She enjoyed lake activities, mountain beauty, and skiing at the nearby Mt Abram and Sunday River ski areas. After years of creating fond memories, Laurie decided to make the Cat’s Meow her year-round residence. 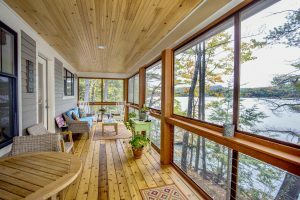 The objective for TDArchitect was to retain the character of the camp, enhance the porch, redesign the kitchen, and maximize lake views while incorporating modern conveniences and energy efficiencies into a transformed home perfectly suited to Laurie’s needs and wants. Since the property is a narrow strip of land sandwiched between the South Pond shoreline and Greenwood Road, shoreland zoning requirements and road setbacks presented significant constraints. The original camp had 650 square feet of living space, plus a loft, on a 27’ by 24’ foundation. Laurie needed designated space for a home office, artwork, and special furniture. The design needed to account for guests, and outdoor entertaining, and storage space for a car and sporting equipment. Given the state and local zoning laws, the design was constrained to the original footprint of the camp. We increased the usable living area through careful allocation of space and by designing to the maximum height allowable by code. 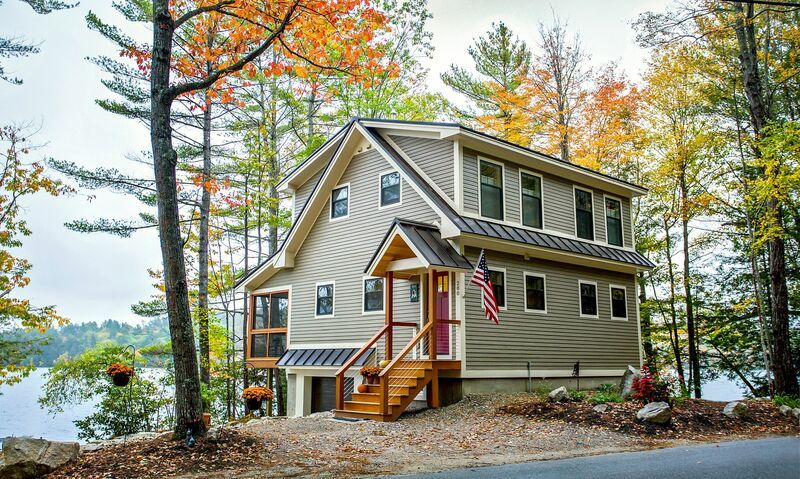 Laurie’s new home takes full advantage of lake views from the living room, updated kitchen, and upstairs bedrooms through energy efficient Marvin windows. The screened-in porch has cable railing below chair height to maximize lake views while seated. Radiant floors were installed in the garage, basement, and first floors to efficiently keep the home warm and comfortable. 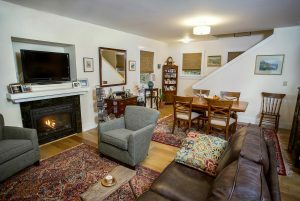 The gas fireplace provides an additional source of heat when wanted and adds to the ambiance of the main living space. 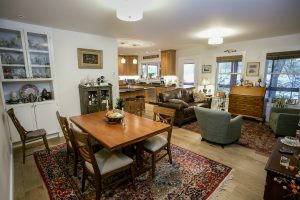 The result is a warm, welcoming, energy efficient, 1300 square foot, home perfectly suited for Laurie’s lifestyle. respond to each clients’ unique project parameters. Contact us to discuss your project.